Just an hour ago, Alan told me over the sat phone that he greatly appreciated the help of his team mates, especially Kami Rita Sherpa. He said he hugely appreciated everyone who has been following and supporting this expedition to fight against Alzheimer’s, especially Albila, Cure Alzheimer’s Fund and USAgainst Alzheimer’s. That is Alan’s message from the summit of K2 to all of us. Please donate now. Thank you. Be sure to listen to Alan’s blog post just prior to this one to hear his stirring words, recorded on summit of K2. 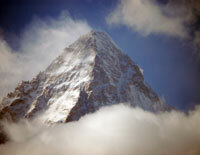 – admin Jim, on behalf of Alan Arnette who has now climbed K2 for Alzheimer’s. Such passion in your voice Alan. Once again congratulations my dear friend , Niko. Syd. Alan, as a fellow climber (of somewhat lesser peaks), you have my utmost respect for reaching the summit of K2. A donation has been made. Congratulations on your achievement. In-F*ING-credible! Thank you for the vicarious thrills — and for a great cause too. But dammit Alan, you are making it very hard for someone of my age (58.5) to use my age and physical decline not to do — well — just about anything! Happy birthday present that you gave YOURSELF, and shared with all of your fascinated followers too. Huge inspiration, appreciate everything you are doing for Alzheimers. My data (also named Alan) , suffered horribly from early onset. You also motivate me to keep climbing, have been following you for awhile. Great Job on K2. Alan, stupendous achievement for a great cause! You must feel happy, relieved and proud. Have a safe descent and return home knowing that your efforts continue to raise awareness and funds for this horrible disease and you are making a difference. From a mountaineering perspective, nice job! Your hard work and training paid off. Bravo! Alan, fantastic personal achievement fulfilled for you and all the team. Congratulations totally in order, x10. Safe trek, road journey and flight back home. Very best wishes from the UK, Well done! Bravissimo Alan and I am sûre you had a happy anniversaire. Samuli Mansikka who was at the summit with you is at Bas Camp now. I hope your descent is going well. I will be reassure when you will post a message. Waiting for a post that you are well! I saw the dispatch from Madison Mountaineering that all are back at base camp-praying your are safe and sound! According to Alan’s last Spot GPS location 8 hrs ago he was below Camp 2 above the House Chimney. Are there areas here that the SPOT can’t get signal? We’re praying hard that you’re in C1 or BC getting a long deserved sleep, Alan. I’ve been checking in over a hundred times since last night keeping you close in my heart! Congratulations Alan & team! What an amazing and inspiring adventure capped off with a summit of the world’s hardest mountain! Wow! I am in awe. Your enthusiasm and love for your two passions – mountain climbing & beating Alzheimer’s – is unmatched and so very admirable. You inspire us all. Descend safely and we look forward to hearing all about this climb. I hope to see you sooner than later back in CO.
Congratulations on your team’s summit. wishing you a safe trip home. Watching on GPS-looks like all are nearly at base camp-hoping all are well! Waiting for the post that confirms-sending strength and my very best vibes! Looks like you are nearly at Camp 2 Alan. Stay focused, don’t give in to that beast of a mountain. All my climbing friends here in Australia are supporting you and the team. Congratulations and fantastic news! Well done to you and the entire TEAM. Remember safety first on the way back to BC. Cheers and all the best Mate! Support both sentiments completely – well donw and safe home – to all! You’re the real deal – a genuine hero for what you’re doing to raise funds for this terrible disease which has impacted my family. Congratulations to you and your teammates on your successful summit! I pray for a safe descent for all. Question to anyone ….. If my calculations are correct, I have them at Camp 3. Is that correct? Thanks very much. So proud for them! Congratulations on making the summit of K2. Wishing you the best of luck on you and your teammates’ safe descent. Truly a fantastic accomplishment! Alan, you are the man ! Congratulations to you and your team ! Congrats Alan!! Get home safe!! A heartfelt congratulations Alan!!! What an incredible accomplishment. Now get down safely. Awesome Alan! Amazing accomplishment enabled by your amazing commitment and indomitable spirit. Congratulations on a job well done!! Way to go Alan! Awesome achievement and it fell on your birthday to boot! Thanks for the “play-by-play” during your journey! Wishing you a HAPPY BIRTHDAY! What a great way to celebrate! Congrats Alan, and Happy Birthday. Can’t wait to see the video. I’m sure you filmed it. Congratulations Alan on your huge accomplishment on K2, and thank you for your undaunting courage and determination with Alzheimer’s awareness and quest for a cure. Happy Birthday Alan and safe travels. On behalf of our Board of Directors, we wish you a Happy Birthday , Congratulations, and a big Thank You!!!!! Have a safe descent and enjoy your phenominal accomplishment! Congratulations Alan on your K2 summit! Very much looking forward to your trip report and appreciate you sharing this adventure and cause with us. Also appreciate you raising awareness and funds for Alzheimer’s research as I lost a grandfather and great-aunt to this terrible disease. Thank you!